I know, I know...I said today was going to be the birthday post, but we got some snow here last night and that never happens, so I can't let today pass without documenting it. Plus, let's be honest, I am lazy and it was a lot easier to go through the one million pictures I took today as opposed to the approximately 4 million I took of all of the birthday celebrations and activities. Maybe tomorrow, ha! Both Dan's and my offices were closed today as was Lilly's school, so we were all at home for the day. I started my work day off earlier than normal because I knew I'd have some breaks strewn in for snow play, and Dan hung around for most of the day but went into work for a few hours this afternoon around lunch time to knock a few things out. 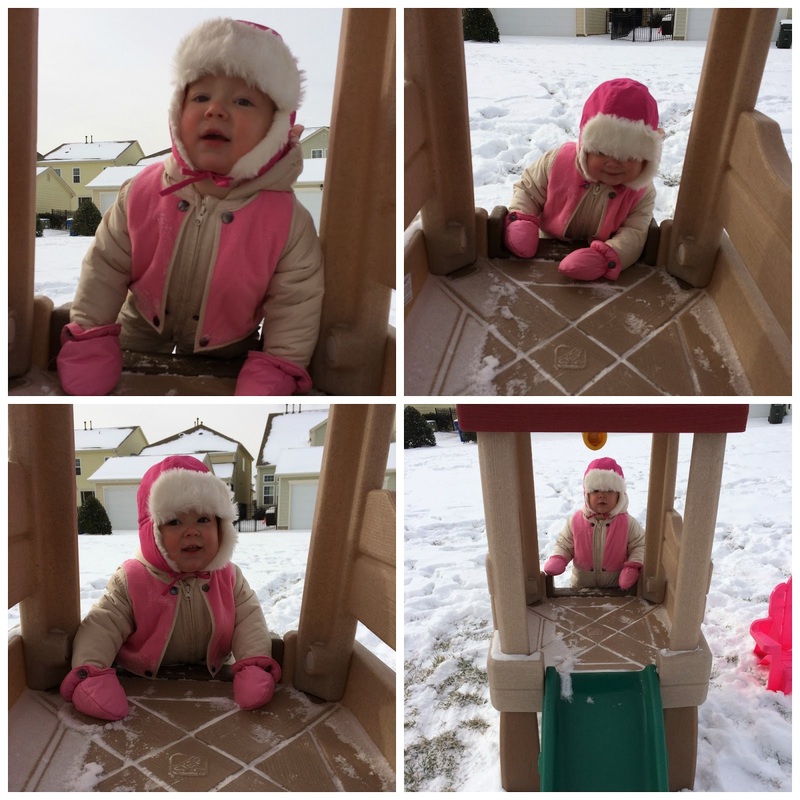 L started the day by sleeping late, and I know you are never supposed to wake a sleeping baby but I ended up waking her up because (a) I was excited to see what she thought of the snow and (b) I knew if she slept too late she wouldn't nap (and I need her to nap!!!). 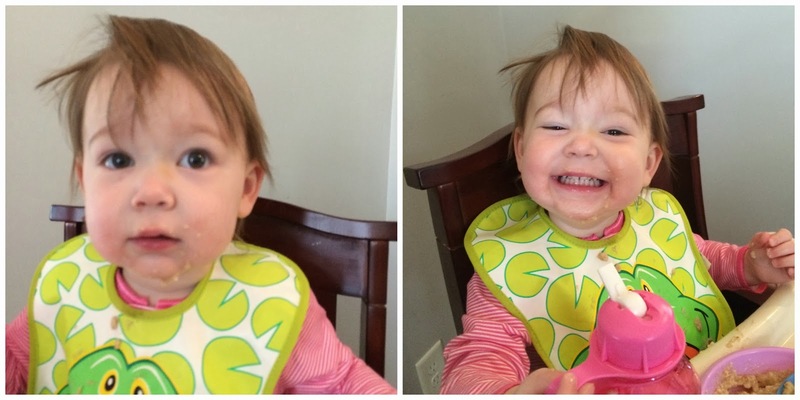 An example of "Lilly's hair is so pretty, Mommy. Lilly's hair is beautiful." Dan played with L until around mid-morning when I could no longer stand it - we HAD to get out in the snow because I was dying to see what Lilly would think (remember when it snowed last year and she hated it?). Lills was SO excited, she had been talking about the snow all morning ever since I showed it to her out the window after she woke up. 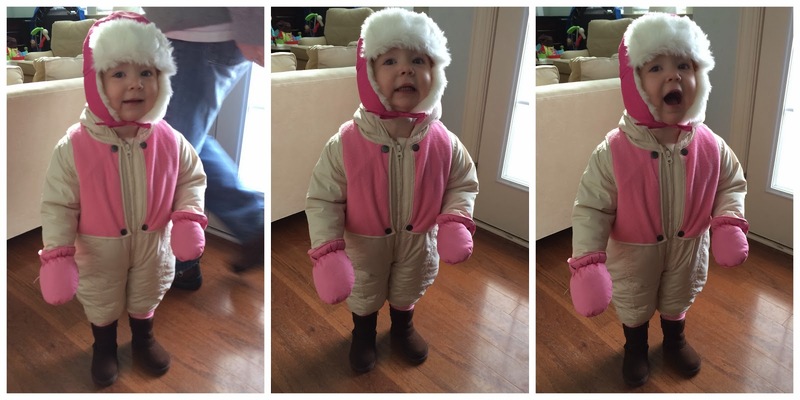 Her excitement even continued while putting on her snowsuit that happens to be WAY too small (It is a size 12-18 months but it's all I had and I figured it was better than jeans!). Seriously, look closely at the pics - the snowsuit ends around her calf and I put on extra leggings and boots to cover the gap. HA. L stood at the window squealing the whole time Dan and I were getting dressed. "I WANT TO GO RUN IN THE SNOW, MOMMY!" I assumed this sentiment would be short-lived based on last year's experience, but much to my elation I was proven very wrong. 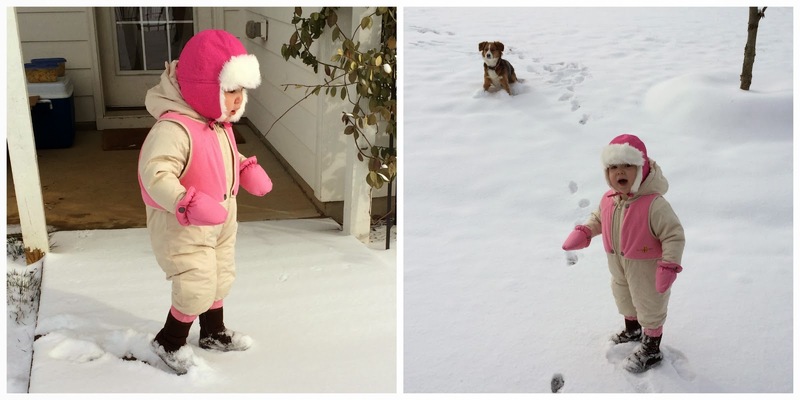 To say that Lilly loved the snow would be putting it far too mildly. Her little lips were quivering, she was so cold, but every time I asked if she wanted to go inside to warm up and she'd say, "No! 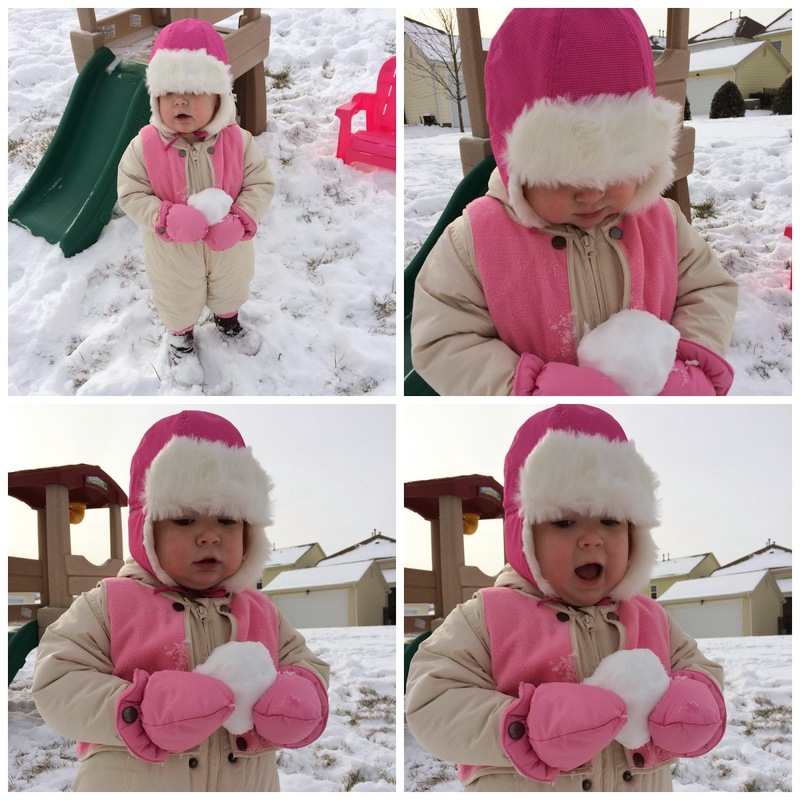 I'm playin' in the snow, Mommy!" 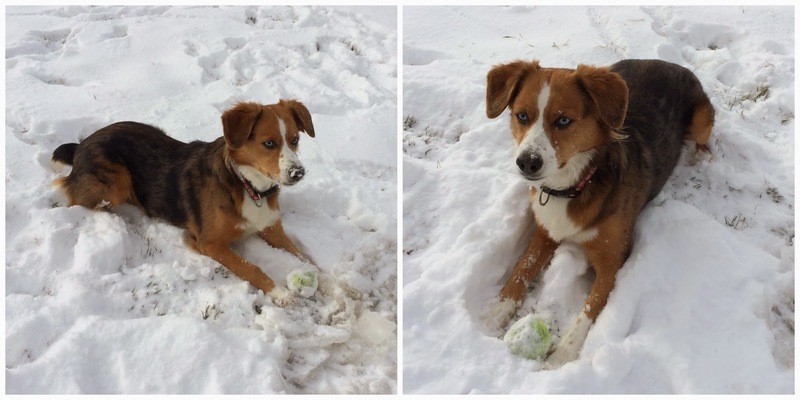 Layla loves the snow, too! Dan went into work around lunch time, so I let Lilly eat lunch on the couch and watch a show so that I could continue to work in peace until it was time to put her down for a nap. 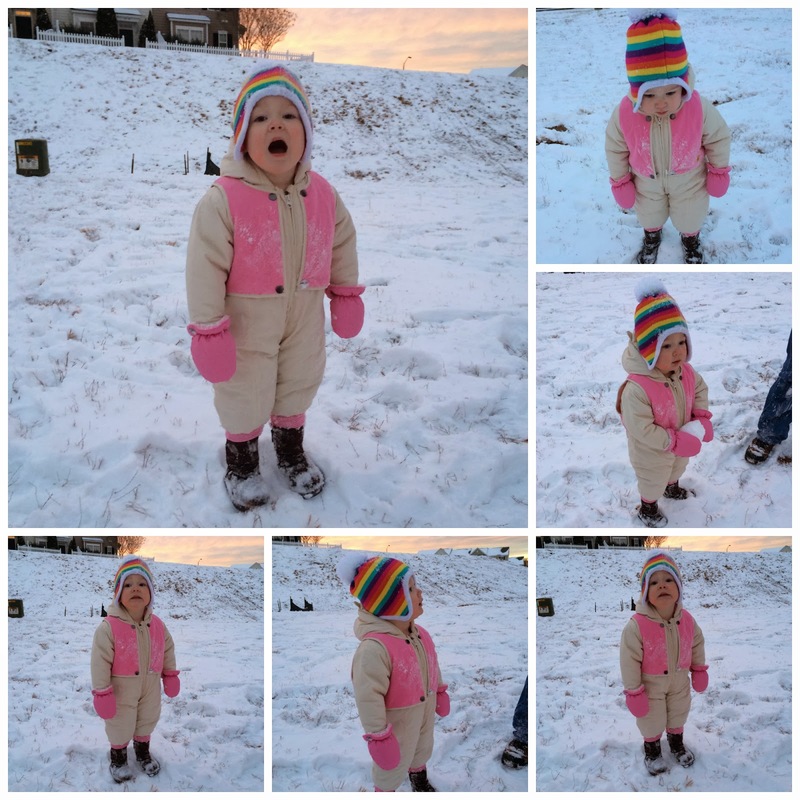 This child was so wound up from all of the snow fun that she would not go to sleep! I put her down at 1:30 and she did not fall asleep until 4:00. I was shocked, she played so hard outside that I know she was exhausted. She was playing in her crib, singing to lovey and every few minutes yelling, "MOMMY! I WANT TO GO PLAY IN THE SNOW AGAIN!" I let her sleep until 5:00 so she got at least a short nap, and her first request when she got out of bed was to go back out. 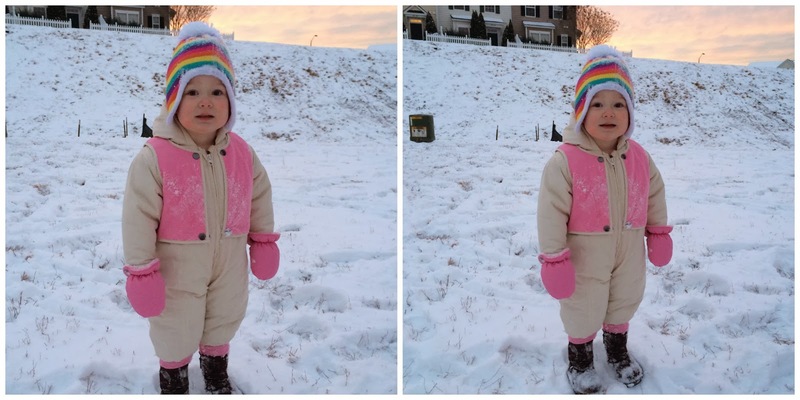 She had a minor meltdown where she no longer wanted to go out to play in the snow and didn't want to put her snowsuit back on, but we braved the tantrum and dressed her back up to go back out anyway because we wanted to see what she thought about sledding. Turns out Lills is not a huge fan of sledding. She didn't cry, but was very serious and when we asked if she wanted to go again she said no. I took some hilarious videos of this but unfortunately for you I am too lazy to confiscate Dan's phone and go downstairs to upload them currently. 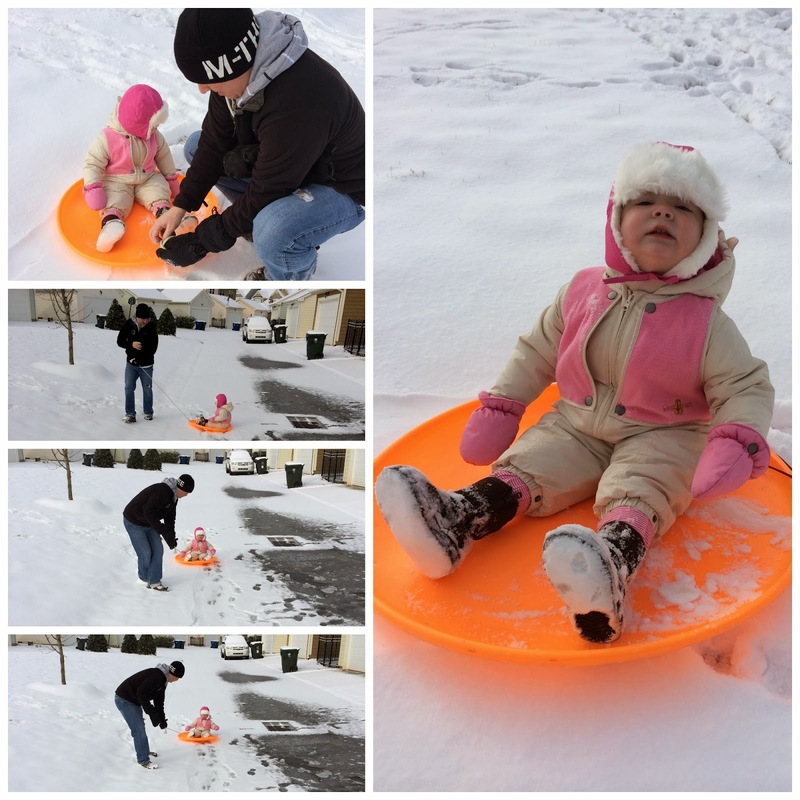 She did, however, love this kind of "sledding." She squealed and giggled and thought Daddy pulling her around was the best ever. Love all of the snow pictures! We only lasted about 20 minutes because it was so cold and I realized I didn't have any snow/rain boots that fit Winsley.